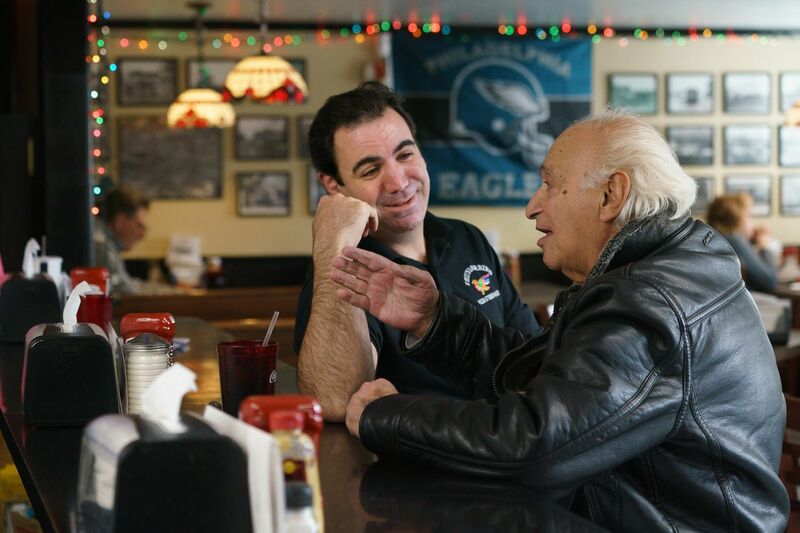 Owner Tom Greco (left) talks with longtime customer George Dulgerian at Thunderbird steak and pizza shop, where cries of "Go, Birds!" have been heard for weeks. The Broomall restaurant was started in 1956 by Greco's grandfather Salvatore. Shirley Chalick might have been the wrong person to ask. But the 84-year-old former schoolteacher sits at the counter of Thunderbird so often for lunch, she should know, I figured. Surely, Shirley had heard the Eagles chatter at this third-generation steak shop that doubles as a town square in Delaware County. She was on one of 10 stools at the single-slab counter when I walked through the door Thursday. A steaming vegetable calzone was coming her way. An ex-Philly schoolteacher named John Spano was working the grill while Pete DePrince, behind him, made hoagies on a wooden cutting board concave from decades of slicing rolls right down the middle. An Eagles banner hung over one of seven booths made of wooden church pews from the 1950s. A dry-erase board warned that people had better order their hot wings now — before Sunday’s playoff game against the Bears. "It's like 'Happy Days' in here," says one customer, a regular going back 30 years. The roadside steak shop founded on West Chester Pike in Broomall by grandpa Salvatore Greco of Sicily, I had figured, would give me a great look into Eagles mania in crusty Delco, Land of Crazed Sports Fans. It would be my first visit to Thunderbird. But as Shirley would soon point out, the Eagles were just a boring subplot at this remarkable place. “I’ve been a customer here since 1957,” she said as I grabbed the stool to her right. “Go, Birds!” all the other patrons have been shouting for weeks, she said. But Shirley considered something else much more fascinating. She pointed to a dark-haired 48-year-old man smiling behind the counter a few feet away: Tom Greco. Tom is the youngest of three brothers, all of whom took over the place more than two decades ago when their dad, a sax-player-son of grandpa Sal, died way too young, in the early 1990s. Longtime customer Shirley Chalick talks with her former student and Thunderbird owner Tom Greco at the counter at the Thunderbird steak and pizza shop, in Broomall. This place on the Pike, just west of the Blue Route, is where you go to feel connected in a suburb with no town center and on a four-lane road with no sidewalks. This place is like home. With just five parking spots out front, there are clashes with neighboring businesses over South Philly-style parking by the cheesesteak-obsessed. And if you drive too fast, at 40 mph, chances are you won’t even see it. And yet, through the heart of its owners, Thunderbird is “almost one of a kind,” Shirley insisted. It’s known locally — and who cares if no one else knows? The laws of modern capitalism would say this place should have bitten the dust a long time ago. But true to the grit throughout die-hard Delco, Tom and his brothers, Steve and Bill, have stubbornly clung to what their grandfather created in 1956. Everyone who walks through the door is expected to chitchat. Trash-talking is welcome, too. And anyone is free to join whatever pool-of-the-month the guys behind the counter are cooking up while slinging chipped beef. Longtime customers Denny Nicholson Sr. (from left), owner Tom Greco, Seth Pancoast Jr., and Shirley Chalick at the Thunderbird counter. “We even had a pool on who the next pope was gonna be," Nicole Sargent, niece of “Uncle Pete” the hoagie maker, reminisced during Thursday’s lunch rush. No one would turn off the TV news until they learned that Francis had won the papal sweepstakes with a white plume wafting from the Vatican in 2013. “Didn’t do you any good,” Spano fired back as he scraped beef bits into the grill gutter so the next heap of sliced onions could hit the heat. John Spano (front center), Thunderbird cheesesteak chef, and Pete DePrince (back right), prep chef. Paul Baker, insurance agent from Narberth, would eat his chicken salad sandwich no other way, he said from the counter, where he has sat for 30 years. Pete, it should be noted, was an Eagles fan until 1980, the season Ron Jaworski’s team lost to Oakland in the Super Bowl. He is a Steelers turncoat and is tormented daily about it at Thunderbird. But last year’s historic Philly win has softened his once-scorned heart. Pete bought some Eagles merchandise. There is hope. Customer Bill Gavin (left) and owner Tom Greco at the Thunderbird steak and pizza shop. Tom Greco called his distributor the day after New Year’s. He couldn’t remember: How many wings had he ordered during last year’s playoffs? For the Super Bowl, the shop told customers it would take only preorders for wings. At noon on Game Day, Greco turned off the phones so everyone could focus. They had to bake, fry, and dress nearly 4,500 pieces of chicken before closing the shop at 5. Let’s hope the Eagles stay hot. Whatever it takes to keep this Thunderbird humming for years.